The doctrine of the fourfold Self and its three vestures is outlined in Prashna Upanishad, clearly stated in Mandukya Upanishad, and developed by Shankara in several treatises. The leading thought of this doctrine is the unity of the Eternal and the Self. This Self is manifested in four modes . The first, outermost mode of the Self appears in waking life as PHYSICAL CONSCIOUSNESS, in the physical vesture of the gross body; enjoying outward things through “nineteen mouths”—five perceiving, five acting, five vital, and four inward powers; these inward powers are mind, reason, imagination, physical self-consciousness. The second mode of the Self appears in dream life as EMOTIONAL CONSCIOUSNESS, in the subtle vesture, perceiving inwardly through nineteen powers; the subtle counterparts of the former physical powers. The third mode of the Self appears in dreamless life as INTUITIONAL CONSCIOUSNESS, in the causal vesture; so called because it causes the two former modes of the Self to become manifested in a perpetual series of births and rebirths, and is thus “the womb of all (births),” “the inner ruler,” who guides the series of births from beginning to end. The fourth mode of the Self is ABSOLUTE CONSCIOUSNESS, the alone, lonely and pure; without a vesture, because nothing exists outside it, because it is the All, the Eternal. Thus there are four modes of the Self—physical, emotional, intuitional, and absolute consciousness; and three vestures, the physical, subtle, and causal bodies; so that one may call this either a fourfold or a sevenfold classification. With this short introduction, we may turn to the Sanskrit text. The unchanging OM represents the All, and the expansion of this is: What was, what is, what shall be. All this is indicated by OM. And the other, that is beyond the three times, is also included in OM. All this is the Eternal; the Self is the Eternal; and this Self has four modes. The WORLD-FIRE, the enjoyer of gross things through nineteen mouths, sevenfold, outwardly conscious, standing in waking-life, is the first mode. The RADIANT, the enjoyer of finer things through nineteen mouths, sevenfold, inwardly conscious, standing in dream-life, is the second mode. When, reaching rest, he desires no desire at all, and dreams no dream at all, this is dreamless life. The INTUITIONAL, whose mouth is direct consciousness, enjoyer of bliss, blissful, knowing uniformly and become uniform, standing in dreamless-life, is the third mode. This is the All-Lord, this the All-Knower, this the Inner-Ruler, the womb of all, the emanating and withdrawing of beings. Unseen, unactionable, unseizable, unmarked, unthinkable; whose self is its own evidence; in whom the expanded world has ceased; the peaceful, benign, secondless; this they think is the fourth mode, this is the SELF, the end of knowledge. 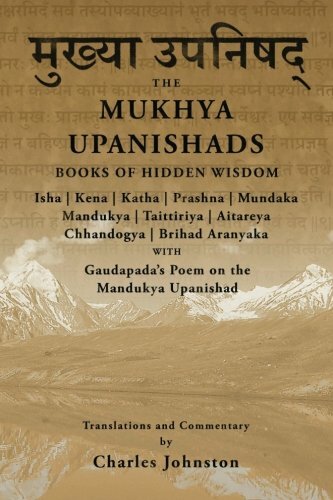 The sentences of this Upanishad are so full of thought that a commentary might be written on every word; indeed, commentaries have been written on every word, and on these there are other commentaries, themselves again commented on. The essence of all these has been summed up by Shankara; a few sentences of his, taken from Tattva Bodha, may make the thought underlying the Upanishad more clear. The Self is he who stands apart from the physical, emotional, and causal vestures; beyond the five veils; witness of the three states; whose own nature is Being, Consciousness, Bliss. The physical vesture is made of the five elements fivefolded; is born through works; is the house where pleasure and pain are tasted; this vesture “is, is born, grows, declines, wastes, perishes;” these are its six changes. The emotional vesture is made of the five elements not fivefolded; is born through works; is the instrument whereby pleasure and pain are tasted; the five perceiving, the five active, the five vital powers, mind and reason, are its seventeen parts. The causal vesture is formed of the ineffable, beginningless illusion [of separateness]; it is the cause and source of the two former vestures; it arises through ignorance [of identity]; it is direct consciousness. The three states are waking, dream, dreamless life. In waking-life, perception is through hearing and the other powers, sound and the other objects. The Self, while attributing itself thus to the physical vesture, is called the WORLD-SELF [physical consciousness]. The world that is beheld in time of rest, made up of impressions of what has been seen and heard in waking, is dream-life. The Self, while attributing itself thus to the emotional vesture, is called the RADIANT-SELF [mental consciousness]. Dreamless life is when I perceive nothing separate at all, and happily enjoy rest. The Self, while thus attributing itself to the causal vesture, is called the INTUITIONAL-SELF [spiritual consciousness]. The Absolute SELF is Being, Consciousness, Bliss. Being is what stands through the three times—present, past and future. Consciousness is the own-nature of perceiving. Bliss is the own nature of joy. Thus let a man know his own Self as Being, Consciousness, Bliss.